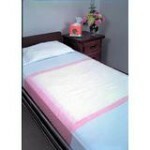 We carry disposable bed pads by many different brands. 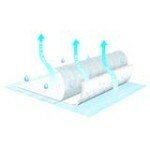 Disposable Underpads protects the bedding at night against leakage. 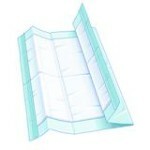 Idiaper carries the disposable bed pads. Disposable underpads are used to protect your furniture, car upholstery and bedding from the accidents that do occur when it comes to incontinence. Idiaper would like to make those accidents less dramatic and traumatic for those involved. With the use of an underpad, you can make the cleanup a little easier. No one feels good about themselves after one of these accidents but you can at least prevent any damage which can help smooth things over. You may find that the disposables are good for the on the go side of your life while the reusables are good for home use. 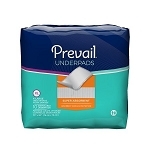 The manufacturers of each brand disposable underpad that we carry has been in the incontinence field for many years. They bring their technology, design and innovation into the underpad range of products. Tranquility - Tranquility has been developing and improving their incontinence supplies for over 45 years. They have brought the super absorbent core into their disposable underpad line of products. Medline - This company, started in 1910, has expanded its products to include most all healthcare items. 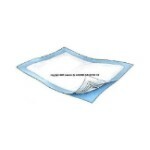 The Medline underpads are available in either reusable or disposable. There is a wide variety of sizes, color and absorbencies. Dignity - Dignity has a type of pad for everyone's needs. The smaller size pad could be tucked away inside to take-along bag with the other supplies for a "just-in-case" use. The pads are disposable and easy to use. 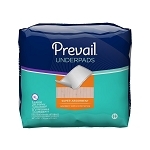 Prevail - First Quality, makers of Prevail, also have this line of underpads. They are all constructed with the bonded construction to prevent top sheet separation and clumping. This makes the underpad comfortable to either sit or lay on. Covidien/Kendall - Covidien is one of the top global producers of products in the healthcare field. They are dedicated to finding medical solutions for a better patient outcome. One of their leading brands is Kendall. Kendall brings you underpads for daily use for patient care. Attends - Attends has been a leading manufacturer of incontinence supplies for over 30 years. Attends has broaden the product line to include all of your incontinence needs and requirements. There are many products required in addition to the containment garment. Attends offers everything from washcloths, pad, belted garments, underpads along with the diapers and briefs. Underpads have many uses. They can be placed under the person during the changing time to prevent any overflow from damaging the surface. By using an underpad, with a mattress pad, can help save your mattress from stains and odors. Many people also place them in their cars to protect their car upholstery while transporting someone with incontinence needs. Most of the time, it is just for added protection. But that added protection will save you in cleaning costs or mattress replacement. They can also be used during the interim period while trying to find the correct diaper/brief for your needs. Sometimes even the best quality diaper/brief will leak if it does not fit properly. You can use an underpad until you find the perfect diaper/brief with the perfect fit for your body form. Give idiaper a call or email with any questions or concerns.